It's almost funny that April is National Oral Health month - only because I have an upcoming dentist appointment. The worst time I was in the dentist's chair was when I was 35 weeks pregnant and had a wisdom tooth pulled. 70 per cent of all pregnant women suffer from inflamed gums, which is a sign of gingivitis...but not all pregnant women get teeth pulled! To keep your teeth healthy and happy, through pregnancy or not, dentists recommend brushing twice daily for two minutes (I love my Oral-B® ProfessionalCare SmartSeries 5000 with SmartGuide™ Electric Toothbrush - it times my brushing for me), flossing once daily and using a rinse. Most Canadians do admit to not following this routine. 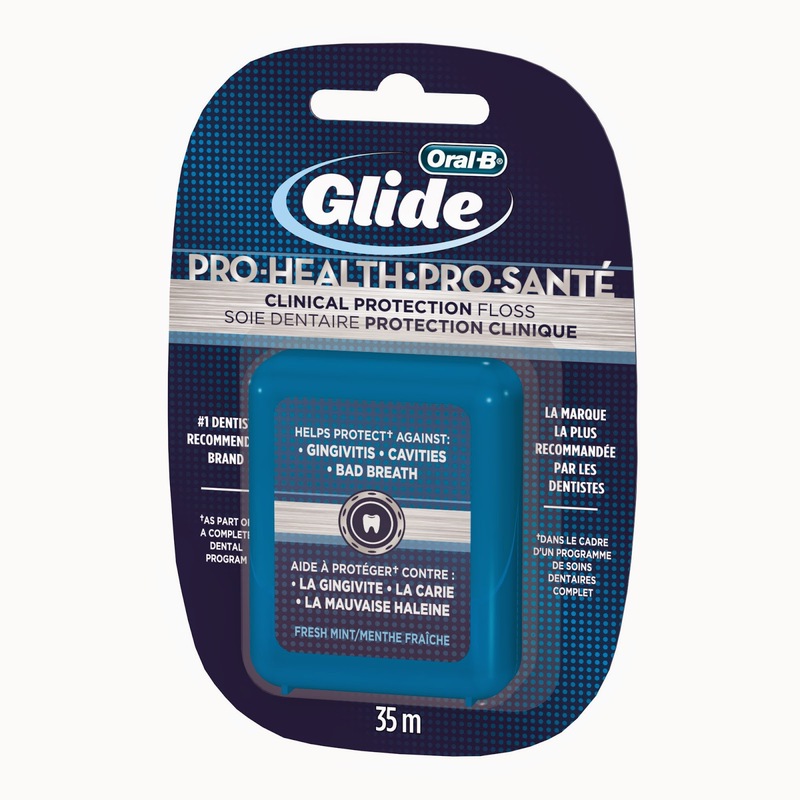 Thankfully, Oral-B Pro-Health Clinical Protection Floss is clinically proven to help reverse gingivitis in two weeks as part of a comprehensive dental routine. By entering the following contest you are accepting that if you win your contact information will be shared with a P&G PR and shipping agency for the purpose of mailing your prize. Please allow 4-6 weeks from the contest closure date to receive your prize. This giveaway may appear on other blogs as part of the #PGmom program. However, to be fair, you can only win once per giveaway. If your name is chosen more than once, another winner will be selected. All winners must be from within Canada excluding Quebec. Valid entries only. Contest ends April 22nd, 2014. For further contest rules, refer to the Terms and Conditions within the Rafflecopter. I brush 2-3 times a day.. I am horrible about flossing. I brush in the morning and before bed and I floss probably twice a day on average! I brush at least twice a day and floss nightly. I brush morning and night and floss often! Brush twice a day and floss often! I brush a few times a day. I often forget to floss, so do that only 2-3 times a week. My routine includes brushing twice a day, flossing between meals/snacks and mouth wash in the morning. I brush twice a day and use whitening mouth wash before bed. I know I should floss but I usually skip it! I brush twice a day and floss too! I brush my teeth daily with my electric toothbrush. I need to be more regular with my flossing though! Brushing twice a day & flossing when I remember. I brush twice a day and use cavity fighting mouthwash. I floss at night then brush teeth. Brush twice daily. Floss when I remember although I carry floss with me everywhere. Nothing worse than getting something stuck in your teeth. I used to brush more often but now with kids I am lucky if I get it done twice a day - after breakfast and before bed. I sometimes use mouthwash and don't floss near as often as I should. I do see the dentist regularly which gives me comfort. I brush twice a day. I try to brush twice a day and I floss about once a week. I know its not the best oral care routine. Brush in morning and brush and floss at night. Brushing and flossing twice a day. I brush twice a day, and am trying to keep up flossing once a day. I brush and floss in the morning and at night. I floss first, then brush after every meal. Before bed, I use mouthwash. I brush my teeth morning and night , floss daily and rinse. I brush twice a day. Sometimes more when encouraging my son to brush. I try to floss but rarely remember! I brush at least twice a day but I have to admit that I do not floss as much as I should. I also use a waterpik about once a week. I brush after every meal and floss every other day! brush in the morning and at night. floss while i'm watching tv at night. I brush at least twice a day and use a water-flosser at night. I should probably should use real floss at some point during the day, as I cannot stand anything stuck between my teeth. I brush at least twice a day and floss once a day. I brush at least 2 times a day and try to floss when i can. Bailey Dexter. I brush after every meal & floss at bedtime!